While there are plenty of very nicely modded 2002s on the scene, few are quite as in-your-face and proud about it as this feisty little wide-body build. Words and photos: Robb Pritchard. Dave Smith is known in VW bus circles fur his slammed 1957 Split Screen T2, which isn’t just a regular feature vehicle but a multi-award winner as well but he’s also always got an eye out for his next project. 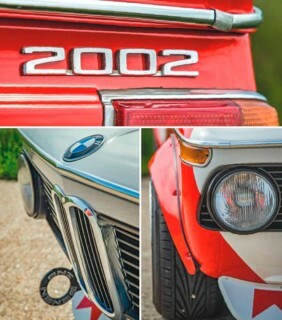 He had a classic Mercedes-Benz in the workshop, which had just been fully resprayed and had all rust and mechanical works virtually complete, ready for the next stage of having a fully custom air bag system fitted but, when he came across a 1974 BMW 2002 on the Internet, it was instantly forgotten and quickly sold to free up some funds. “I lost a lot of money on the Mercedes." he muses, “but I didn't care as I just had to have the BMW, so it was worth it The car in question was white with a green roof, tiny 13’ gold wheels and a big stock front bumper, which was one of the first things that came off. “It’s a petite little classic, but I am not a stock kind of guy,” smiles Dave, as the pair of slammed buses resting on their chassis’ on his drive attest to. At first he didn’t have any real plan of what he wanted to do with it, apart from knowing that it had to go lower. Much lower. The first job was fitting an off-the-shelf suspension kit, but the 1” drop was never going to satisfy a man who lives the low life, so he resigned himself to the fact that it was going to have to be a big transformation to turn the 2002 into the car he wanted. “I wanted a more aggressive stance and the only way to get that was with an angle-grinder and some thoughtful removal of some of the metalwork...” he grins. The arches were cut and new suspension mountings were fabricated at Dave’s trusted go-to metalworker, Matt over at Balls’d. But while the interior was taken out to get to the rear arches they found that the floor had rotted in a few places. “It was a bit disappointing but not too unexpected,” Dave says. “Just because of its age though, and the fact that it was pretty tired, not because it wasn’t well looked after,” so that was another item added to the to-do list. Once the metalwork was taken care of, a set of custom coilovers was installed using some parts from a Mk2 Golf, which dropped the car down to its current level of belly-scraping lowness, a massive 5” lower than stock. “It’s obviously a lot more expensive to have it taken into a shop to be worked on, but it looks so much better than any bolt-on kit,” Dave grins and he’s not wrong, as that massive drop has contributed hugely to the car’s spectacular appearance. With the suspension sorted, next on the to-do list were wheels, which are obviously a very important part of a car’s look. 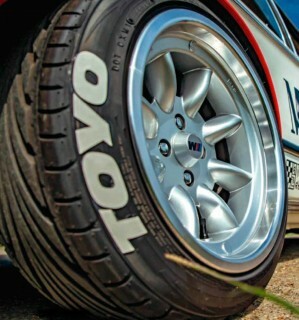 Dave has a preference for BBS but wanted something different, and while looking around online he came across Minilites. 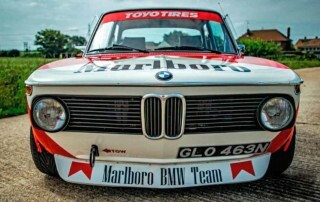 “They’re a bit different for a BMW but still fit with the retro race look I wanted” he explains. Unfortunately, they didn’t have the offset he wanted, but that was no problem for Dave, he simply got them to make a bespoke set of 15s with diamond cut lips and the seriously aggressive ET-25 offset he wanted. Initially he had a pair of 8” rims on the front and 9s on the rear, but once mounted on the car Dave just didn’t think that they looked right so ordered another pair of 9s for the front. “It’s a very square car so the equal sized wheels work well,” he says and we’re with him on that one. Finally, a slightly stretched set of Toyos, 195s up front and 215s on the rear, got the car’s stance just how he wanted it. With wheels and suspension sorted it was then time for the flares. Dave went through a couple of sets, but they weren’t quite wide enough for his needs so he went with a set of 90mm JDM drift-style ones that needed to be trimmed and heated up and then formed to the desired shape, and some more metal had to go… “It’s always scary to leave your car with someone to cut up but when it came out of the shop it was perfect. Panic over,” he grins and the end result is spectacular. Those big, fat wide arches really pump up this little 2002’s presence and give it some serious muscle that you just wouldn’t expect from a car like this, and it makes for a real head-turning build. Another element of the styling that we have to mention are the front lip and rear spoiler. Dave couldn’t find anything to suit his taste made by any company in the UK that wasn’t just another Turbo replica, especially as he didn’t want to turn up at a show with something that everyone else has, and so he went to KoogleWerks in the USA, a company that hand-crafts bespoke items and panels for Datsuns and BMWs. “The look is not a million miles from Japanese cars’ stance and they’re just what I wanted,” he says and the stubby little front chin lip makes the 2002 look even lower for added visual drama, while the sharply-angled rear spoiler is the perfect balancing element for the car’s rear end. Then of course there’s the livery. 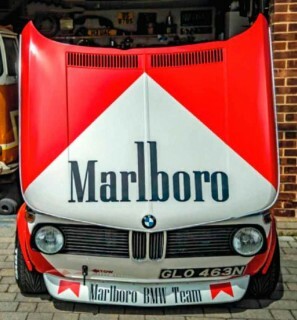 Dave wanted a colour scheme that was striking but retro at the same time and decided that the classic, angular Marlboro red-on- white combo would complement the lines of the car really well. 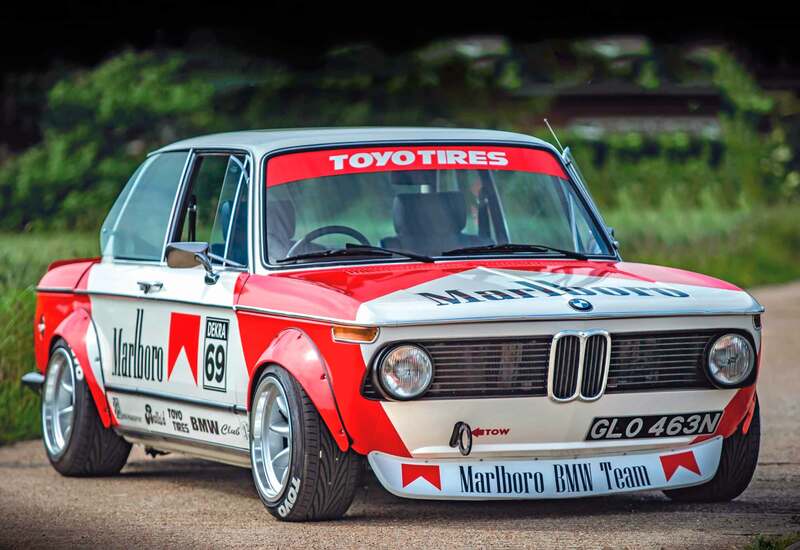 Several BMWs of yesteryear ran with the same colours in various touring car championships but Dave didn’t want an exact copy so told 3SixtyWraps what he was thinking of. “I was hooked from the first moment I saw the rendering of it so didn’t waste any time giving the approval to proceed,” he smiles. “It looks like it’s just spent a Sunday afternoon blasting around Brands Hatch,” he adds with a grin and the livery suits the whole look of this build so well. It wasn’t happening,” he says. “Then I found out that the main centre section is the same, it’s just the end pieces that are shorter,” so he bought the chrome parts of the Touring bumper, took the plastic trim off the original and cut it down to fit. Job sorted. While this 2002 impresses with its visual drama, there’s a lot more to this build than simply styling and Dave has paid plenty of attention to the M10 under the bonnet. “Another local company that I have used and become good friends with over the years, called RDS Roadsport, started by skimming the cylinder head and rebuilding the top end, which was fine to start with and got me out and about,” says Dave. “But then, after an epic bottom end engine failure on the way home from a European show which, to be fair, I was warned would possibly happen, it was time to remove the engine and go for the full rebuild, adding as many performance parts as possible. This started with getting the block re-bored to allow tii pistons to be fitted to raise the compression from 8.5:1 to 9.5:1. The flywheel was also lightened, crankshaft dynamically balanced and the head worked on again, being skimmed with the addition of a Piper 292° fast road cam. The end result was that pretty much everything was either improved or replaced, from the timing chain and guides, down to the oil pump being upgraded to an E30 type,” he says. 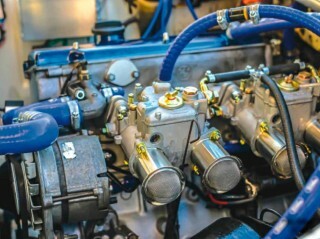 “Twin Weber 45 carbs were added, with a full custom stainless steel exhaust and manifold to give it a nice little gargle to suit the retro racing look and performance I was aiming for.” The engine was finished off with new Magnecor leads, Samco hoses, an electric fuel pump, large capacity stainless steel radiator and new electric fan kit, ARF oil catch can, Jaymic strut brace and, with the battery relocated to the boot area the engine was complete. 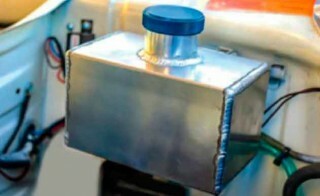 If you look closely, you can see that Dave even had a bespoke stainless steel washer bottle made to further complement the engine bay, and that all adds up to a serious amount of work. 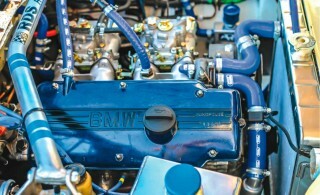 Not only has it resulted in a very spicy little M10, with plenty of punch and a sizzling soundtrack to go with it, but it’s also given Dave a mighty fine centrepiece for his build in the shape of that engine bay, with its colour-coded valve cover, hoses, leads and those mesh-covered carbs. The interior, meanwhile, is a mix of original 1970s BMW styling and Dave’s exacting personal touches. The dashboard is all as it was but the original huge steering wheel, which really didn’t fit with the car any more, was replaced with a much smaller and sportier Momo item. 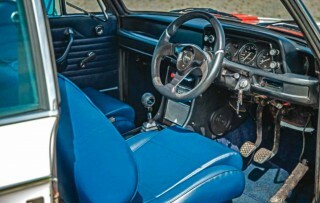 A shorter Racetec gear stick is another nice-looking addition while the original seats which, because of their age, were pretty much beyond repair, were swapped with a lovely set of Cobra Stuttgart recliners. The original Motorola radio that came with the car, meanwhile, now lives on a shelf in the garage as Dave has installed a Becker Europa; it might not exactly be the top of today’s range, but it’s a delightfully retro item that was very much a must-have back in the ’70s, and here it’s been modified to be able to connect to modern day devices, making it a lot more versatile than you might think. So what’s the 2002 experience like after all that work, all those mods? “It drives like it looks,” Dave grins. “Nice and stiff and, to my ears, the beautiful exhaust note is like music. It’s maybe not as fast as an M3 or more modern car, but I have to keep reminding myself that essentially it’s a 44-year-old classic with just a few little tweaks to the stock engine,” but those tweaks have made all the difference and have given this 2002 so much character and plenty of performance to boot. “I think the car is pretty much there now in how I want it to look and perform,” says Dave, “but I am never really happy and am always looking to improve it, so there’s a strong possibility that this time next year it may also have a rear roll-cage fitted. I do need to weigh-up if this is worth losing the use of the rear seats for or not, as the family does occasionally like to venture out with me to the odd show or even for a quick blast around the block,” he muses and it’s nice to hear that it’s not just Dave that gets to enjoy this raucous little classic. 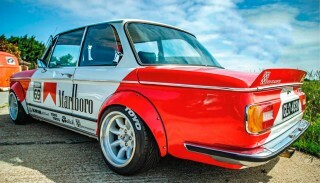 Whatever he does decide to do and whatever future mods he chooses for his 2002, this feisty little classic is never going to stop turning heads and causing a stir wherever it goes. THANKS Massive thanks to Richard and Mark from RDS Roadsport (engine build and rust repairs), Matt from Balls’d (for the stance), the guys at 3SixtyWraps (for the retro race look), it couldn’t have been achieved without them! Front spoiler is a custom item from the States Twin Weber 45 carbs.